Liquor liberation has come! The idea of state control of private clubs has been banished to Outer Darkness. And Utahns across the land can toast to the fact that a Republican, conservative state is finally “de-socializing” the booze biz. But is the war over? Far from it, say hospitality advocates who have barely taken a pause to celebrate before planning for the next legislative session. No hangover can keep reformers from building on the momentum of recent successes to seek new concessions: One goal is for bars to be able to purchase alcohol from the state at wholesale prices, while another is to see more than two bars on a city block. The association is still huddling to determine its priorities for 2010, but it is already lobbying for reforms before the next legislative session. One issue is the requirement for bars to purchase high alcohol-content beer at retail prices. This means the high-octane stuff can’t be purchased wholesale, but at liquor-store prices. Bars, then, have to mark up the price on beer to make it profitable to sell. “Most [bars] can’t possibly pass those costs on to customers,” Marcy says. Marked up, the price of most tasty imports is out of the average drinker’s budget (a good Belgium import could easily run $10 to $15 from the state liquor store). Another issue likely to be at the forefront of future liquor-reform wrangling will be changing the state’s current two-bars-per-city-block formula. A similar idea was floated by Salt Lake City Mayor Ralph Becker recently in hopes of livening up downtown with an entertainment district. For Marcy, the most logical way to reduce the number of drunken drivers on the road is to group bars closer together. “We’ve never, ever thought that you should keep this large spatial distance between [bars],” Marcy says. Salt Lake City’s municipal ordinances might become a proving ground for testing the viability of bars being a viable component of a walkable (or stumble-able) neighborhood. The city recently approved an ordinance that permits a beer bar like Andy’s Place at 479. E. 300 South to operate as a full bar within a residential mixed-use zone. Another bar, The Jam, at 751 N. 300 West, is in the process of seeking a similar ordinance change. Marcy realizes it won’t be easy to accomplish back-to-back legislative reforms. But she’s also used to hearing what “can’t” be done. The million-dollar question for all those who fear Big Brother may be hiding in the bottom of their beer glass is: What happens when your ID gets scanned? According to the Utah Department of Alcohol Beverage Control, the law is simple. The information encoded into the scanner cannot be more than name, age, gender and a code identifying what kind of information was used (driver license, passport, military ID, etc.) and the expiration of that ID. A City Weekly reporter got his ID test-scanned at the downtown Murphy’s Bar & Grill on Main with an orange Codecorp scanner that looked like a price gun. With a little blue-and-red twinkle, the barcode was scanned, and the display showed a name and an age. 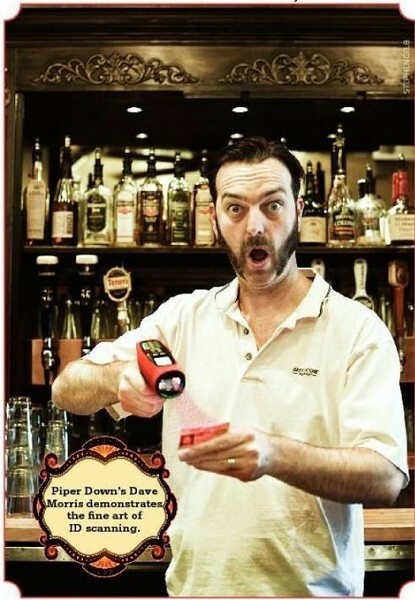 Bartenders see all the pertinent info they need, so they can quickly check the scanner and then match the ID photo with the mug of the guy or gal who gave it to them. Like several other models City Weekly looked at—despite what’s shown on the display screen—additional details besides name and age are captured. But all data is deleted after seven days. A variety of companies market scanners sold across the country—so there’s no 100 percent guarantee that models won’t download additional info that’s encoded in the ID bar code, such as Social Security numbers. However, DABC compliance officers and law enforcement will be regularly screening the scanners to make sure they are deleting the information and taking only the info they are required to—with criminal penalties for bar owners who don’t know how to use their new toys, or aren’t playing nice with them.